KENDOMEN is an ATX PC case capable of accommodating ATX, Micro ATX and Mini ITX motherboards. Classic exteriors and compact interiors. 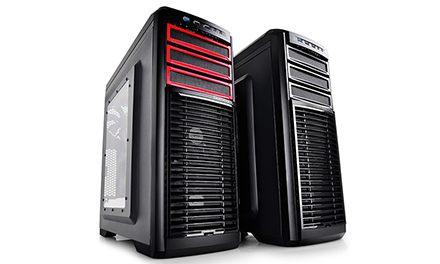 The case features excellent cooling performance, simple installation, superior expandability and easy future maintenance. The KENDOMEN comes with 2 front-mounted LED intake fans, 2 top-mounted exhaust fans (supports liquid cooler instead), and 1 rear-mounted fan. 5 pre-installed fans deliver clean and powerful airflow, allowing builders to skip the fans go directly to the system itself, saving cost and time required to build their prized rig. The fan-speed adjustment switch ensures impressive performance while maintaining low noise. The case features multiple designs that simplify the building process. These designs include: motherboard platform; wide cutout behind the motherboard tray (to accommodate back plate mounted CPU cooler); tool-free ODD/HDD installation; and 15 mm openings for excellent management. KENDOMEN offers plenty of space for expanded storage, including: 3x 5.25-inch bays, 3x 3.5-inch bays (also compatible with 2.5-inch SSD/HDD), and 3x 2.5-inch drive bays. Removing the 2.5-inch drive cage allows the installation of a 15.7-inch or 400 mm-long graphic card while providing 7 expansion slots, making KENDOMEN the best chassis for the most enthusiastic builder. The top, front and bottom panels of KENDOMEN are equipped with filters that protect against dust and dirt. Easy removal design for the top and front panels make cleaning so much easier. The control platform and I/O ports of KENDOMEN are located at an easily accessible top portion of the front panel. Fan speed controller allows easy management of noise level and cooling performance. USB 3.0 ports offer rapid data exchange between different devices.